She shook that emphatic little forefinger of hers in his face at parting. 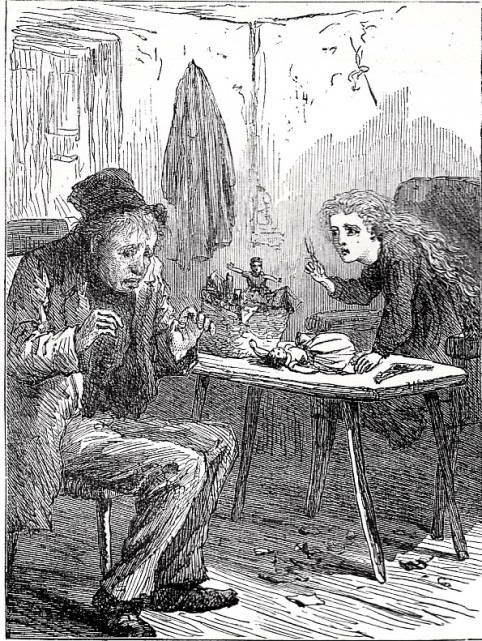 (p. 231) — James Mahoney's forty-first illustration for Charles Dickens's Our Mutual Friend, Household Edition (New York), 1875. Wood-engraving by the Dalziels, 10.5 cm high x 13.3 cm wide. 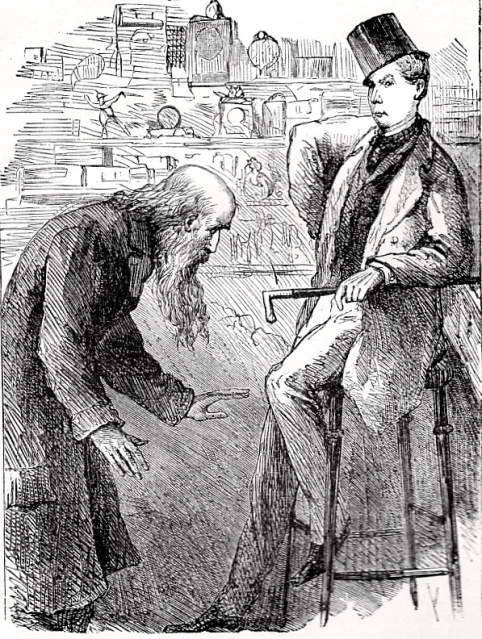 The Chapman and Hall woodcut for thirteenth chapter, "Give a Dog a Bad Name, and Hang Him," in the third book, "A Long Lane," has a much longer caption than that in the Harper and Brothers volume, published that same year in New York: "She shook that emphatic little forefinger of hers in his face at parting, as earnestly and reproachfully as she had ever shaken it at her grim old child at home". 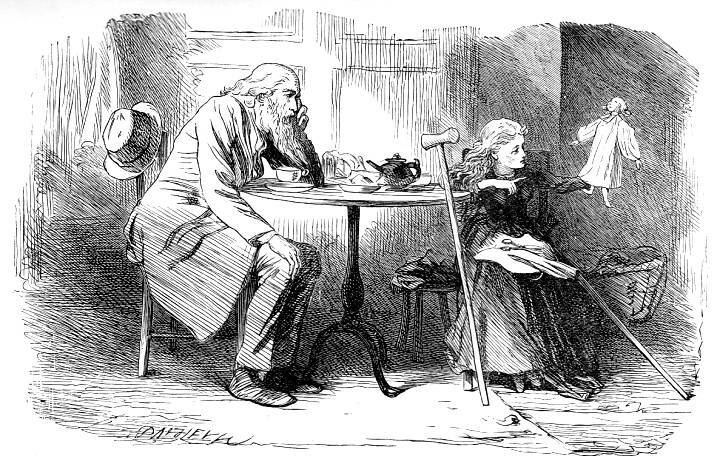 Otherwise, the wood-engraving depicting the Jenny's reproaching Riah for his hard-hearted treatment of Twemlow (in fact, his "superior's" uncompromising treatment of the debtor) is identical in both volumes, suggesting that the Dalziels produced two copies of each woodblock engraving from Mahoney's original line-drawings. 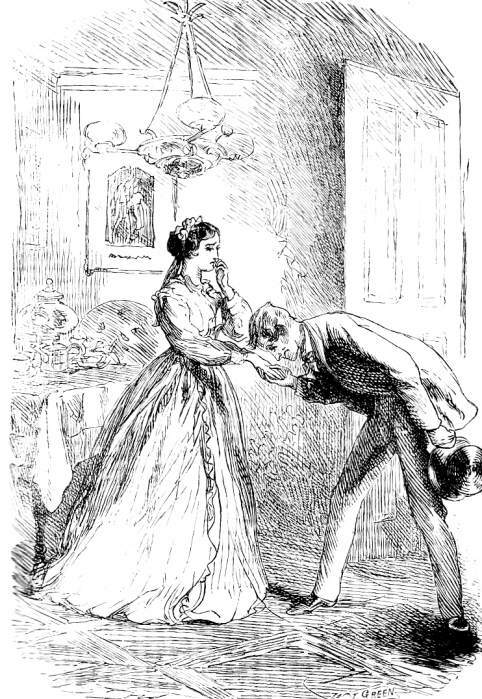 This is yet another of those illustrations possessing a different caption in the Chapman and Hall and Harper and Brothers versions of the same book, so that, although the American publisher must have received a list of illustrations, the firm's editor chose occasionally to deviate from the given wording and did not give such a list at the beginning of the volume. Two previous examples are Witnessing the Agreement and Mr. and Mrs. Lammle, both of which also have much longer captions in the London text. For further differences, including the London and New York volumes having entirely different frontispieces, see The differences between the British and American printings of Mahoney's illustrations for Dickens's Our Mutual Friend. Fascination Fledgeby was in such a merry vein when the counting-house was cleared of him, that he had nothing for it but to go to the window, and lean his arms on the frame of the blind, and have his silent laugh out, with his back to his subordinate. When he turned round again with a composed countenance, his subordinate still stood in the same place, and the dolls' dressmaker sat behind the door with a look of horror. "Halloa!" cried Mr. Fledgeby, "you're forgetting this young lady, Mr. Riah, and she has been waiting long enough too. Sell her her waste, please, and give her good measure if you can make up your mind to do the liberal thing for once." "There, my Cinderella dear," said the old man in a whisper, and with a worn-out look, "the basket's full now. Bless you! And get you gone!" "Don't call me your Cinderella dear," returned Miss Wren. "O you cruel godmother!" "You are not the godmother at all!" said she. "You are the Wolf in the Forest, the wicked Wolf! And if ever my dear Lizzie is sold and betrayed, I shall know who sold and betrayed her!" — Book Three, Chapter 13, "Give a Dog a Bad Name, and Hang Him," p. 243. The Characters of Charles Dickens pourtrayed in a series of original watercolours by "Kyd." London, Paris, and New York: Raphael Tuck & Sons, n. d.
Cohen, Jane Rabb. "The Illustrators of Our Mutual Friend, and The Mystery of Edwin Drood: Marcus Stone, Charles Collins, Luke Fildes." Charles Dickens and His Original Illustrators. Canton: Ohio U. P., 1980. Pp. 203-228. Dickens, Charles. Our Mutual Friend. Illustrated by Marcus Stone [40 composite wood-block engravings]. Volume 14 of the Authentic Edition of the Works of Charles Dickens. London: Chapman and Hall; New York: Charles Scribners' Sons, 1901 [based on the original nineteen-month serial and the two-volume edition of 1865]. Dickens, Charles. Our Mutual Friend. Illustrated by F. O. C. Darley and John Gilbert. The Works of Charles Dickens. The Household Edition. New York: Hurd and Houghton, 1866. Vol. 1. Dickens, Charles. Our Mutual Friend. Illustrated by Sol Eytinge, Jr. The Works of Charles Dickens. The Illustrated Household Edition. Boston: Ticknor and Field; Lee and Shepard; New York: Charles T. Dillingham, 1870 [first published in The Diamond Edition, 1867]. Dickens, Charles. Our Mutual Friend. Illustrated by James Mahoney [58 composite wood-block engravings]. The Works of Charles Dickens. The Household Edition. London: Chapman and Hall; New York: Harper & Bros., 1875. Grass, Sean. Charles Dickens's 'Our Mutual Friend': A Publishing History. Burlington, VT, and Farnham, Surrey: Ashgate, 2014. Hammerton, J. A. "Chapter 21: The Other Novels." The Dickens Picture-Book. The CharlesDickens Library Edition. London: Educational Book, 1910. Vol. 17. Pp.441-442. 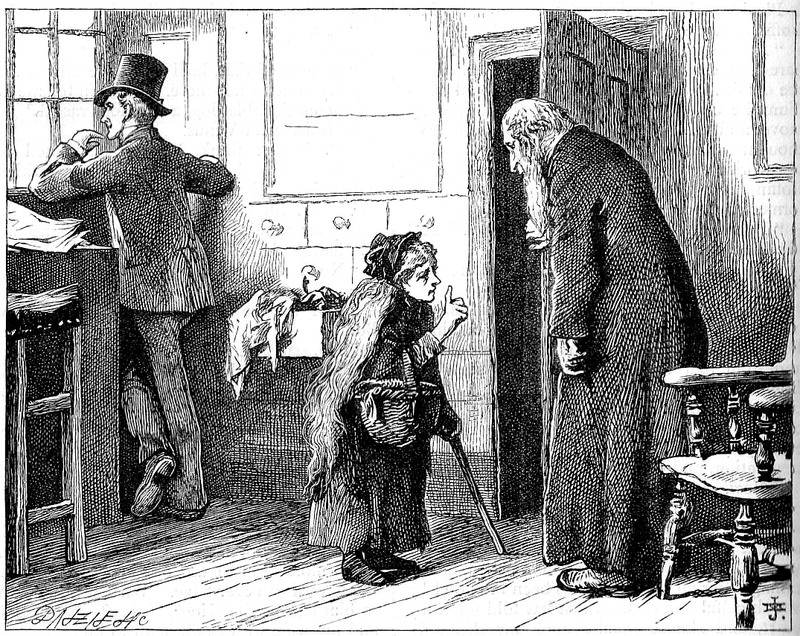 Kitton, Frederic G. Dickens and His Illustrators. (1899). Rpt. Honolulu: University of Hawaii, 2004. "Our Mutual Friend — Fifty-eight Illustrations by James Mahoney." Scenes and Characters from the Works of Charles Dickens, Being Eight Hundred and Sixty-six Drawings by Fred Barnard, Gordon Thomson, Hablot Knight Browne (Phiz), J. McL. Ralston, J. Mahoney, H. French, Charles Green, E. G. Dalziel, A. B. Frost, F. A. Fraser, and Sir Luke Fildes. London: Chapman and Hall, 1907.